I love reading others stories. It’s very encouraging. There are so many talented people. The last few days have busy. I haven’t been able to post. Hopefully it’s calming down. Hey Millie, such an ingenious piece! 🙂 loved it. If you ever find time, do visit my blog and share your thoughts on it! I’d be elated! P.s. I new to the Blogging atmosphere! 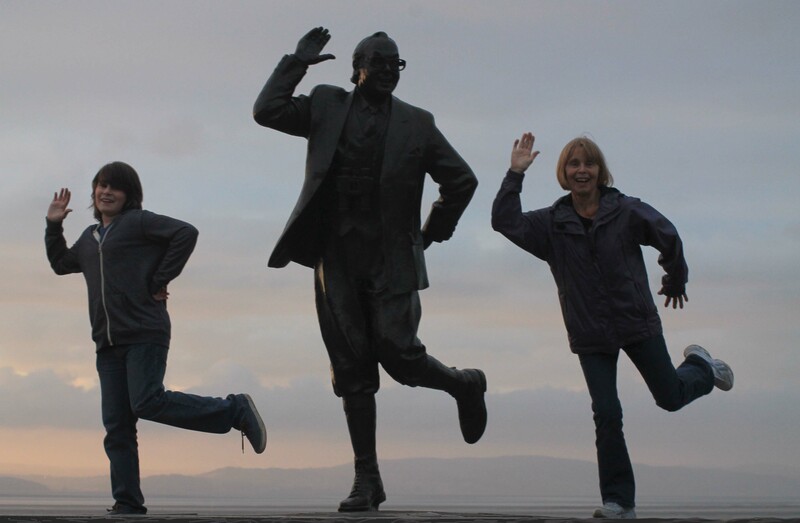 Morecambe is a lovely place, and the duo never failed to make me laugh. Great story and I hope she someday finds happiness. I love the picture with your grandson in it! Adorable! This was a very thought provoking story Millie. I enjoyed reading it but I’m afraid she is stepping out of the pan and into the fire. Excellent story and writing as always! Kieran has always been a poser when the cameras were around – quite the opposite of me! But the photos were just a bit of fun. I was so angry to learn that vandals has hacked off Eric’s leg. How mindless is that! That is terrible someone chopped off his leg. Some people can be so destructive. Great story! Margaret really knows how to plan ahead! Hopefully, she will be happy one day. Thank you for sharing the history Morecambe and the neat photos. I love it when someone takes life into their own hands. Really nice story! It’s so sad that Margaret would wait for Jack to die before she moved on with her life 😦 People do that. Such lost lives and years. I like Margaret’s thinking. Sounds like she’s deserved a good time, too. There’s a real progression here from Margaret who visits her mother to Margaret the woman with a plan. Nicely done! Awesome story Millie. I hope Margaret’s secret lunch dates stay secret and she has a much happier life with Peter. 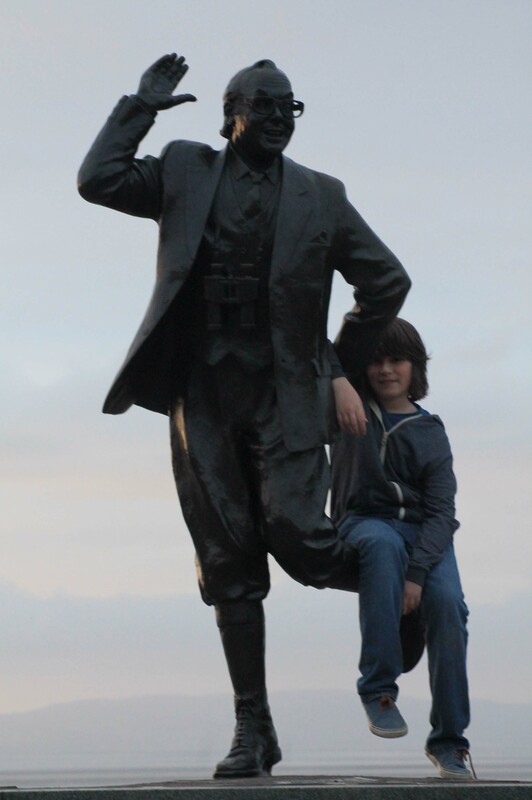 Looks like you and your grandson had fun in the statue photos. Oh yes I’ve heard of Morecambe and Wise but don’t think I’ve seen the show. Your husband and daughters should have joined in the fun too!! I agree. They missed out, big time. Ohhhh…I smell trouble for Margaret. These things often don’t go to plan. Lovely story Millie. We are fine Millie, thank you. Oh wow quite scandalous. I’m not sure I want to root for her or against her lol. Haha I loved the ending! Her poor mothers just the excuse isn’t she? :p and thanks for the info about Morcombe. I’ve travelled a lot through the English countryside and it’s so sad to see so many beautiful villages suffering the same fate of demise as the population ages with no one to replace it with the young people moving away to the big cities..
Isn’t it ironic that the country is more expensive to live in than cities when you think that it would be the other way around? It’s just speeding up the homogenisation of our society isn’t it? So sad, all those beautiful places could one day fall into decline with no one to care for them..
Let’s hope things change before it gets to that. Younger, less affluent people can’t afford to live in villages for a lot of reasons, as well as house prices. 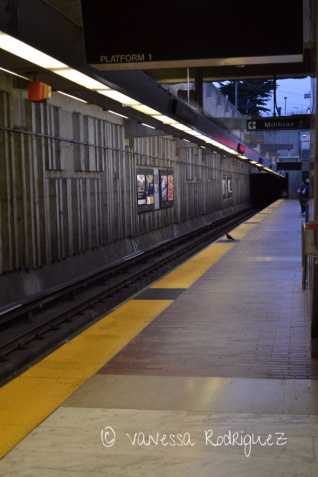 Transport costs to work, usually in towns, is another. And many families can’t afford two cars anyway. Secondary schools are miles away and even Primary ones in some cases. We haven’t got one in our village. Nor have we any shops! It seems an almost impossible situation to rectify, doesn’t it? 🙂 well at least I know who to turn to for help on my story which is set in an English village! Feel free to ask away, any time. Just call me Miss Marple! Haha. Perhaps not, then. Is your book about Zombies? Sounds fascinating … Well, I hope they keep away from our village! No it’s not really 🙂 I’m writing a bigger story based on White Manor, the flash fiction I wrote a little while ago, and it’s set in a fictitious village called Whitfield. It will have a supernatural element but I’m still playing with ideas on what that will be..
Go for it, Az. It sounds great! All the best with writing it. Yeah Margaret; I think you deserve to have a fling of your own. And, if things with Peter work out. . .
I’ll definitely pass the message on to Margaret, Phylor. 🙂 She’ll appreciate the encouraging words. Oops, I didn’t mean you = millethom! I wrote my comment incomprehensibly!